More importantly, India has a very long way still to run – both in economic and steelmaking terms. Under India’s National Steel Policy, the Indian government has set a target of reaching 300 million mt/year of crude steel capacity by 2030, driven by per capita steel consumption rising to 158 kg from around 61 kg currently. New Delhi wants Indian steel to supply the ‘Make in India’ program and plans to lift manufacturing’s share of GDP to 25% by 2022. 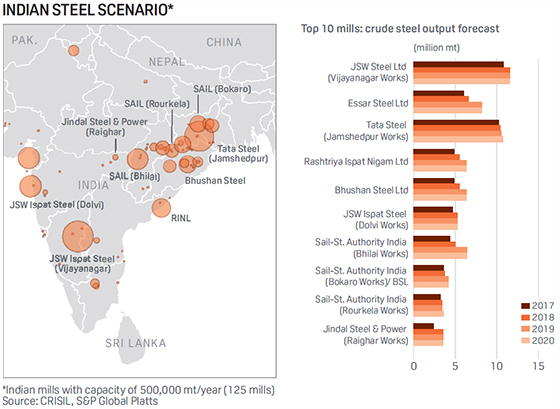 Utilizing S&P Global subsidiary CRISIL’s steel mill data, the map produced here covers all steel mills in India with a capacity of at least 500,000 mt/year. At present, the data captures 125 Indian steel mills with an estimated total capacity of 106 million mt/year, which is approximately 81% of the official Indian crude steel capacity reported for 2017. Based on current capacity utilization, along with individual expansion/closure plans outlined in company reports, we estimate average annual production growth of 7%-8% over 2018-2020. By 2020, we expect India will reach consistent utilization rates of around 80%, up from levels in the mid-70s earlier. Despite some macro uncertainties post India’s election in 2019, we believe India’s met coal demand will continue to increase to meet the needs of a fast-growing steel sector. Recent consolidation in India’s steel sector, and greater international participation, should help ensure the industry is on a surer footing going into its next growth phase. 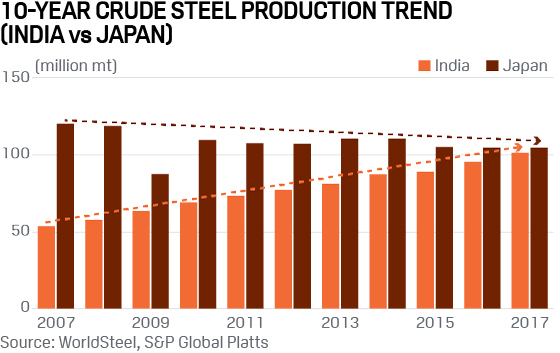 Platts forecasts India’s crude steel production will trend towards 125 million mt by 2020, a 21% increase from 2017. Pig iron output could increase to 81 million mt, from 66 million mt reported for 2017. 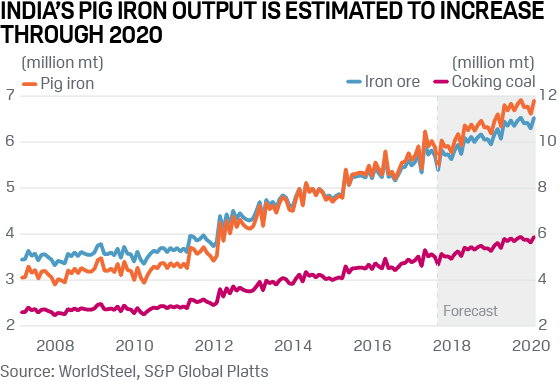 Based on the “rule of thumb” for India that 1 mt of pig iron requires 1.6 mt of iron ore and 0.85 mt of coking coal, we estimate iron ore and coking coal demand at 130 million mt and 70 million mt, respectively, by 2020. This would mark a 25% increase, or an increment of 5 million mt/year, in metallurgical demand from 2017 levels. 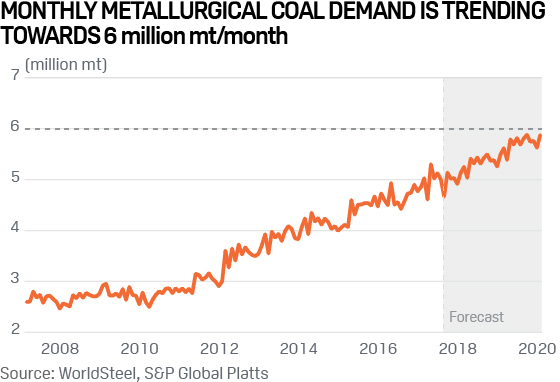 Monthly metallurgical coal demand is therefore forecast to trend higher towards 6 million mt at the end of 2020. One of the key market implications could be the mining majors potentially benefiting from India’s growing appetite for metallurgical coal. Since the start of 2017, major Indian steelmakers have been seeking to secure long-term contracts with miners, ensuring reliable supply. 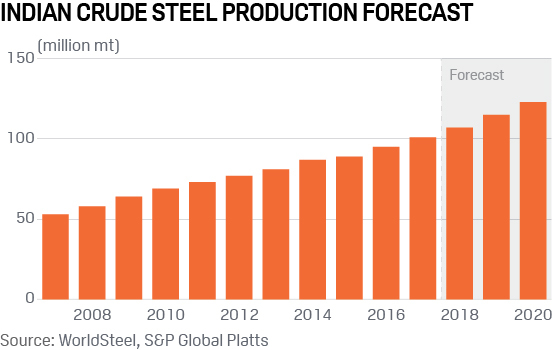 This comes at a time when large steelmakers are looking to boost efficiencies and lift capacity utilization rates after acquiring distressed steel assets that were operating well below capacity. Indian steelmakers are typically favor importing high fluidity and high vitrinite type coking coals. Fluidity is measured by the difference between melting and solidifying temperatures of coal. High fluidity gives higher “bendability” of coals and optimizes the coke input into a blast furnace. Vitrinite indicates the heat tolerance of each coal, reflecting better performance in the blast furnace when higher. With the estimated ramp-up of India’s met coal demand by 5 million mt/year through 2020, implied demand for the preferred likes of Premium Mid-Vol such as BHP-Mitsubishi Alliance’s (BMA) Goonyella, Peak Downs North and semi-hard coals like Kestrel, in eastern Australia’s Queensland, will grow for the foreseeable future. Besides relying on Australian coals, steelmakers in India were understood to be diversifying their coal blending by opting for other origin coals, including US material. They have also sought cheaper alternatives such as pulverized coal injection (PCI) and semi-soft. This was particularly the case when hard coking coal prices rose to $300/mt FOB Australia in recent years due to supply constraints in China and Australia. Indian mills are particularly susceptible to price spikes and in certain cases were forced to mothball some blast furnace operations until steel margins improved. India has also been keen to develop Mozambique coking coal, with both Tata Steel and the state-owned consortium International Coal Ventures Limited (ICVL) investing in the east African country. However, Mozambique supply has not come to fruition as expected, with only Vale’s Moatize mine producing sizable volumes of met coal at around 7 million-8 million mt/year. As a result, it is Australian-based exporters that are best placed to benefit from India’s steel capacity expansion.